The purpose of this site is to compile a comprehensive database of the false reports of "hate crimes" committed in the USA. It builds on the work of Laird Wilcox, whose Crying Wolf (PDF) is the only book dedicated to this subject so far. 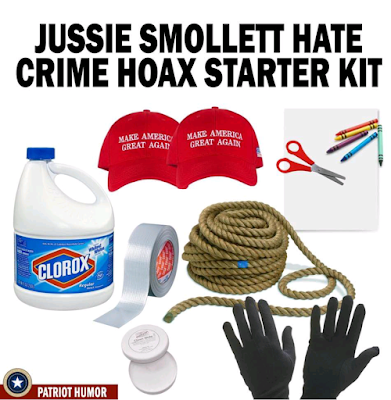 "Jussie Smollet was suppose to have been attacked by Trump supporters wearing a MAGA hat. None of his story adds up. He went out at 2 am alone for a sandwich, supposedly gets attacked, and walks the rest of the way home, didn't call 9-1-1, still had a rope around his neck, still had his sandwich intact, said he had broken ribs and went to the hospital. NOW he is backtracking and said he did not go to the hospital and that his ribs were just "bruised". Who keeps the rope on their neck after being freed?? That makes no sense. Police can only find some hooded figures they can't see, and no video of the beating. There are cameras all up and down the streets. That night was one of the coldest nights in Chicago at 2 am it was only -12 degrees, with a windchill of -20 degrees. Who goes out for a sandwich at 2 am in -12 degree weather. Smollett claims he was bitten, but no teeth marks. 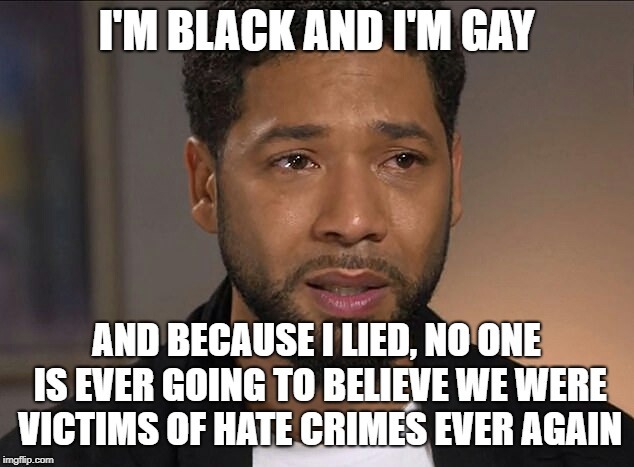 It is reported that police have all of Smollett's journey on video to and from the store, all but 60 seconds, and an attack of that magnitude, with people fleeing the scene is not on the videos. None of this is adding up." Edited 1 time(s). Last edit at 02/08/2019 08:54PM by Jennifer. Police in Toronto, Ontario, say that an 11-year-old Muslim girl, who claimed attackers tried to cut off her hijab, lied about the attack. Three African-American University at Albany students who allegedly falsely reported a hate crime have now been given probation and community service. Israeli authorities have arrested a 19-year-old suspect in connection with dozens of hoax bomb threats to Jewish community centers in the United States and around the world. ABC News reports that the unnamed suspect is a dual U.S.-Israel citizen. A 14-year-old student allegedly hoaxed a Twitter threat from a social media account that she claimed was the Ku Klux Klan (KKK). A man who claimed to have been the victim of a racist hate crime actually hoaxed the incident, writing “n*gger lovers” on his garage door. Two college students who are President-Elect Donald Trump supporters have been cleared of accusations that they harassed other students after celebrating Trump’s victory with police finding no evidence to support the hate crime claims. After a Muslim woman faked a hate crime where she alleged President-Elect Donald Trump supporters attacked her on a subway as New Yorkers looked on, Newsweek is now saying the hoax “highlights pressures” on Muslim teen girls. A Muslim woman who drummed up mainstream media hysteria claiming she was attacked on a New York City subway by President-Elect Donald Trump supporters is now under arrest for fabricating the hate crime and filing a false police report. A Villanova University student has asked police to drop their investigation into an incident in which she alleged she was attacked by white male President-Elect Donald Trump supporters. Yvette Cooper has announced that MPs will look into how social media companies can censor a “tide of hate”, and strongly implied that freedom of speech should mean freedom from criticism in remarks ahead of a new inquiry into “hate crime”. LAFAYETTE, Louisiana – A Muslim student who reported her hijab was pulled from her head and was robbed by President-Elect Donald Trump supporters will now face charges for the false claims. Edited 1 time(s). Last edit at 02/08/2019 09:22PM by Jennifer. Other than that, there’s not much. Elizabeth Nolan Brown of Reason.com has posted a more extensive list of cases where police were unable to verify the allegations being made, including an alleged attack on a gay man in Santa Monica, California. Rep. Jared Huffman (D-CA) documented three men showing up at a Veterans Day parade with Confederate flags. Provocative? Deliberately. Offensive? Yes, to most. Hate crime? No. Meanwhile, thousands of people flood city centers in Los Angeles, Portland, New York and elsewhere, in some cases setting fires, smashing windows and vandalizing anything they can. Night after night, the protests have continued, organized by radical left-wing organizations such as MoveOn.org and ANSWER, in rejection of the results of a democratic election. Some of the protests have resulted in violent attacks on police, and dozens of arrests. And there have been real hate crimes against Trump supporters, including a videotaped beating of a white man who was targeted because he was accused of voting for Trump. The wave of anti-Trump crimes — “hate crimes” and otherwise — committed by anti-Trump thugs overwhelms, by several orders of magnitude, whatever crimes are being attributed to Trump supporters. The narrative about a wave of “hate crimes” inspired by Trump is a deliberate fabrication, meant to tarnish the President-elect. It is a continuation of false accusations, during the campaign, that Trump represented the second coming of Hitler. It is an attempt to organize a new opposition, based on lies, and the deliberate sowing of mistrust at a time when Americans have been called — by both presidential candidates — to come together. The young woman filed a police report Wednesday claiming two white males approached her near the campus, in the 100 block of Smith Street, around 11 a.m.
She also claimed one of the males was wearing a "Trump" hat and they both yelled racial obscenities at her, police said. Long wrote a police complaint on November 9th that reads in part, "while walking down Crim St to ask for yard signs, three boys began to throw rocks at me." In a reversal of prior statements, Elon University sent out an email to students, faculty and staff Friday night with information about the student who wrote the note "Bye Bye Latinos Hasta La Vista." A significant portion of people who saw the note on social media linked the message to President-elect Donald Trump and viewed it as an attack on the Latino community. The University of South Florida police say a female student who claimed that she was robbed by two men on the school campus, has been arrested for lying about the robbery incident. A Bowling Green State University official announced Friday that a man’s story that he was pushed to the ground, robbed, and called a derogatory slur wasn’t true. — A woman who claimed in a Facebook post that she was a victim of a sexual assault and that Kirkland Police responded but did not investigate, made it all up. Tu’s allegation comes amid a wave of similar stories of racially motivated attacks. In one other case, a Muslim college student in Louisiana who claimed she was attacked admitted that the story was fabricated. A student who was allegedly harassed by two Fresh Meadows high school students on a public bus the day after the presidential election no longer wants to talk about the incident, it was reported on Friday. On Tuesday a social media post showed a photo of a black baby doll in a dorm elevator. But there were also reports students hung the doll with noose around the neck from a shower curtain that included posts about the Trump campaign. A student created a meme with language about “Trump fans” and sent it to friends. ANN ARBOR, MI - Ann Arbor police say there is no evidence to support a Muslim University of Michigan student's claim that a man threatened to light her on fire if she didn't remove her hijab. And she claims not be a Trump suporter. Poor Don the Con and his cultist! Contrary to what the Lying Libs would have you believe There is not an increase in HATE CRIMES because of Trump, or by Trump Supporters, or 'racists', etc. What there is is - AN INCREASE IN FAKE HATE CRIMES -- HATE HOAXES perpetrated by THE LYINIG LIBS and blamed on Trump, Trump Supporters, 'The Right', 'racists', etc. As per usual, it's the Lying Libs and Lying Lib Media who are the dirtbags. A Muslim woman claimed that she was slashed in the face by a man who called her a "terrorist." She subsequently admitted to police that "she made up the claim, and the wound was actually self-inflicted." Youtube personality Callum McSwiggin claimed he was assaulted by three men outside a gay bar in June 2016. However, he was subsequently arrested for vandalizing a car at the scene. Officers attending said he "had no visible injuries." He subsequently pleaded guilty to the change of vandalizing the car and the misdemeanor charge of filing a false police report was dropped. McSwiggan seems to admit on his Facebook account of events that he deliberately injured himself while in custody. On September 20, 2016, Eastern Michigan University reported that it was investigating " who is responsible for spray painting the letters "KKK" and a racial slur on the wall inside the courtyard of Julia Anne King Hall." On November 11, 2016, a female Muslim University of Michigan student claimed that "an unkempt man who appeared intoxicated had approached her near campus, displayed a lighter and threatened to light the garment." Police subsequently determined that the event did not occur and that "there were inconsistencies in the student’s statement, and that witnesses came forward that further invalidated the report." David subsequently confessed to his wife that he had actually done all those things himself, but not until after police had launched a "hate crime investigation" and the well wishers had donated more than $5,000 to the couple. Calgary filmmaker Chris Ball, 25, claimed he was assaulted by Donald Trump supporters following the candidate's win. Images circulated social media that featured Ball covered in blood after an alleged attack by Trump supports in Santa Monica, California. Social media accused Ball of perpetrating a hoax, with many pointing out that 1) the blood in the image "looks fake" and that it looks poorly applied 2) his white watch did not have a drop of blood on it 3) the picture claimed he was at the ER, but he had no wristband 4) Lieut. Saul Rodriguez of the Santa Monica Police Department (SMPD), said there was "absolutely no" report of any such incident happening in the city 5) he changed his story, couldn't remember the time or the exact bar and 6) his career as a makeup artist and set designer for a number of TV shows and movies. She claims to not be a Trump Cultist yet we have this tread by her. She wins right wing extremist award! Heather Heyer was not a fake hate crime Trump and supportes share blame in her death. The tow young men in Portland throat slit was not a fake hate crime. The shooting in Pa was not a fake hate crime. Jeremy Joseph Christian, the 35-year-old Portland man who allegedly murdered two men and left another critically wounded while yelling anti-Muslim slurs in a knife attack on Friday, has been painted by the mainstream media as a “right-wing extremist,” but posts on his Facebook page indicate he was a supporter of socialist Senator Bernie Sanders and Green Party candidate Jill Stein. According to screen captures of his Facebook page obtained by Buzzfeed, Christian was not a Trump supporter, as many media outlets claimed, but was a supporter of the idea of a Sanders/Stein ticket. Jussie Smollett may be the most famous case of faux victimhood but he's by far the only one. Watch this clip to hear just a few of the lesser known "victims." These Hate Hoaxes are only from the last year. So many people want to believe that hate crimes are being committed against liberals by conservatives but that's just not the truth. These are all of the crimes that have been faked by the left to perpetuate a narrative that doesn't exist.